CALGARY, Alberta — The Calgary Flames won’t let a couple bad breaks get them down. “We’ll bounce back from this and have a good home game and get back in the series,” predicted Calgary captain Mark Giordano heading into Games 3 and 4 on Monday and Wednesday at the Scotiabank Saddledome. Saturday’s loss was especially tough for the Flames to swallow since they outshot the Ducks 37-29, including by a 15-6 margin in the second period. They also had an apparent goal by Sam Bennett waved off in the second due to goaltender interference on John Gibson before the puck crossed the line. 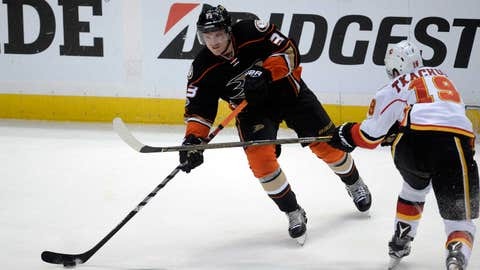 Making matters worse was that the game-winning goal by Anaheim captain Ryan Getzlaf on a power play at 15:14 of the third period was actually a pass that deflected off Flames left winger Lance Bouma’s skate and past stunned goalie Brian Elliott. “It’s pretty disappointing,” said defenseman Dougie Hamilton, who was in the penalty box at the time of the fluky goal. Despite the deficit they’re facing in the series, Hamilton said the Flames have to stay positive heading back home. Anaheim right winger Patrick Eaves, who drew an assist on Getzlaf’s game winner, admitted the Ducks got a fortunate bounce to win Saturday’s game. “I’m sure that they’re happy that they’re scoring and we’re real happy they’re scoring, but there’s other guys that are going to score in this series, for sure,” said Anaheim coach Randy Carlyle, who hasn’t been completely happy with the way his team has played so far.